Unbalancing application or throw. The closest in judo would be Obi-otoshi. Mirror image to the previous section. The sequence begins with the opponent holding your right wrist with his own right hand. Move to your left round to the right of the opponent. 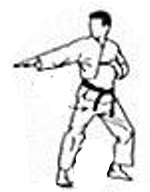 The upstroke of the barai pulls the opponents balance backwards, moves you off line. The downstroke moves his arm down out of the way and gets you behind his arm. Step and 45° behind the opponent's legs with your own left leg. The downstroke of the barai pushes him backwards over your front left leg.